Before we get to the article, take a look at the photo to the left. 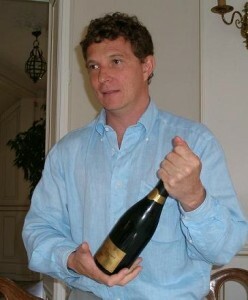 That is Nicolas Chiquet of Gaston Chiquet Champagne. A guy with a name, and his name is on the bottle. How often have you ever experienced that out of Champagne? We often seek out family owned production in all other wine regions on earth but oddly shrug our shoulders with the megabranding of Champagne houses. If we drink “Bob’s Napa Carignane” and we get to know Bob, there is a connection (and also an opportunity to ask why in the world he’s growing Carignane in Napa Valley). Yet Champagne has done such a great job of creating brands that we sometimes forget that the most fascinating wines come from people. Just a thought to chew on. We take Grower Champagne seriously at The Wine Company for many reasons. These wines show a sense of place unlike all the marquee names/brands, and deserve attention from anybody who loves wine. Our Grower-Producer Champagne portfolio is imported by the legendary Terry Theise. The following excerpt is from Terry’s Champagne catalog profiling Gaston Chiquet, and shows the spirit and energy that he brings to his work. Enjoy learning about Gaston Chiquet! “I was touched to see that Peter Liem blogged about tasting two old wines here at Chiquet. I mean, he lives (literally) around the corner, so I’d have thought he meandered over whenever he felt like it and drank some twenty and thirty year old Champagne. I seem to have been wrong. When I read his notes I hadn’t re-read my own, and when we taste together Peter and I almost never compare notes. The first bottle was poured blind, but we knew it was a pre-1988 Special Club because we knew the bottle shape. The color was yellow-green and the first notes of fragrance were iron, burnt toast, flint. The esters came on deliberately, and the wine wanted 30 minutes to open up, but it was revealed to be a ‘76, the freaky-hot vintage we seem to have made a leitmotif of drinking this year. (Lucky Clint Sloan; it’s his birth-year.) The wine got more amazing each moment; the palate started on two distinct layers, one of them charred and the other full of estery- sweet flavor, with an astonishingly complex dialogue between them; still an echo of its first virginal fruit. It was a clearly great wine, definite and stentorian. Then came a ‘75 Club; the palate was lighter, the acidity more prominent, and it was more mushroomy/ cellar-y at first; it also seemed drier – but we’re spoiled now. It came on, oats and earth and low tide and sous-bois, a parallel world where the buses don’t run, as distinct from the explicit ‘76. This wine is deliciously somber, it doesn’t suffer fools, is happy to be by himself. There’s a sweetness not connected to kindness, a rare form of meaning. It was just slightly the “lesser” of the two wines, but I liked drinking it even more, it was so inferential and haunting. Nicolas Chiquet has become my hero. He is an amazingly decent man, thoughtful, conscientious, open. And I have his cell number to call if I am ever pulled over by the local police at a DUI-barricade. I mean, come on; this is Champagne, people. When am I not drinking? I also now know all the small roads to take from the restaurant back to my hotel, to avoid the DUI traps outside Épernay. So I was returning a call from Alexander Chartogne at 9:15 one morning – or thought I was. I had a number on a scrap of paper and called it. A woman answered. I stammered I was looking for Alexander; no one by that name at this number… but then she recognized my voice. “Terry? Is it you? Are you drunk at this hour? ?” I’d called Nicolas’ number, and his (charming American) wife answered. “Not drunk, but evidently seriously confused,” I said. We sell a lot of Chiquet, though I sense the Champagne is in some way misunderstood. By me as well. I am struck by how chiseled and articulate Nicolas’ wines are. I usually think of them as either chalky or fruity, but really they are precise, careful and thorough. I wrote they were “quiet heroes,” because they don’t often get the attention some of the others do. I think if you asked me to sum up Chiquet’s wines in one pithy phrase, I’d have to say either “delicious and articulate” or “articulate and delicious” depending on which you preferred. (Maybe “salacious and ticklish,” in a pinch…). They taste effortless, tactful, yet attractive. What I’m tasting are wines of pure terroir. They are, in effect, anti-varietal. Even the celebrated Aÿ Chardonnay isn’t so much a variant on Chardonnay as it is another dialect of Aÿ. This is a large estate as Récoltants go, with 23 hectares. Chiquets have vineyards in Hautvillers, Mareuil-sur- Aÿ and in Aÿ, from which they make what is probably the only all-Chardonnay Champagne to emerge from this Pinot Noir town. Their base wines always undergo malolactic, but the Champagnes are quite low in dosage, yet they have a suave caramelly richness. I’ve sometimes heard myself say that Chiquet’s N.V. is what Moët & Chandon’s should be. There’s a walnutty style they have in common. Mind you, I don’t clamor for opportunities to drink the Big Fella, but one time we were surprised with a bottle and two flutes waiting in our room when we checked into a hotel we frequent. Curiosity got the better of me, and we opened it. The Champagne was “correct” and a little bland and featureless, and I felt sad that it represented “Champagne” to so many unwary people, who probably don’t think they like Champagne and wonder why it costs so much. Yet at the same time I felt considerable admiration; considering the volume that’s churned out, this wine might have been much worse. I felt it was an industrial wine made with a certain scrupulousness. The parent-company’s business practices are another story, but the wine held up its end. Of course it was the Brut Imperial, and it was a European bottle…. 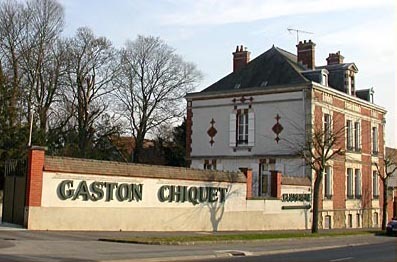 The following restaurants and retailers have purchased the wines of Gaston Chiquet in the previous twelve months. Please call ahead to check availability. The list is alphabetical according to city.